… I am a Christian because of the black church and black faith. When I was far from God, it was the unashamedly Christian black culture, movies, and music of people like Lauryn Hill and Fred Hammond that introduced me to Jesus. It is the black church that so consistently embodies the confounding, radical love of Jesus. What other American community today displays less shame, less reservation, less self-awareness about proclaiming the Christian faith? I will not turn the Bride of the living Christ into a cultural artifact. We serve a God who will make evil scatter with light, who is the answer to every skeptic’s questions, and who is renewing all things. 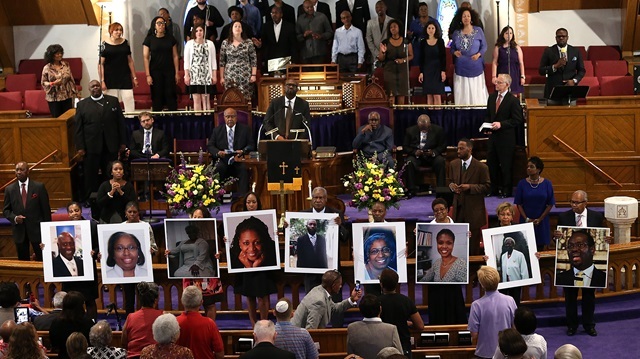 The Charleston family members could forgive because they believe that fateful night in the upper room of Mother Emanuel was not the end of their loved ones’ stories. The Charleston victims are as they were: in the kingdom of God, beloved by him, their greatest longings realized. Soon, people who have never contemplated, let alone attended, a Bible study will presume to identify and take up a secular cause in their names. Why would anyone presume that their legacies should be about anything other than what they were dedicating their time towards? Witnessing to their Lord and Savior, Jesus Christ. On re-watching the video, I couldn’t help noticing the two guards. It felt as though they stood in for the rest of us. At times, I imagined that they imagined taking the cowardly murderer into a private room to exact revenge. But most of the time, they just seem to be suspended in disbelief at the Grace they were listening to, all the while struggling to maintain their emotions. A column by Peggy Noonan about those families is copied in full at end of post. This entry was posted in Catholic Faith & Inspiration, Current Affairs & History and tagged Charleston, Emanuel African Methodist Episcopal Church, Peggy Noonan, South Carolina. Bookmark the permalink.